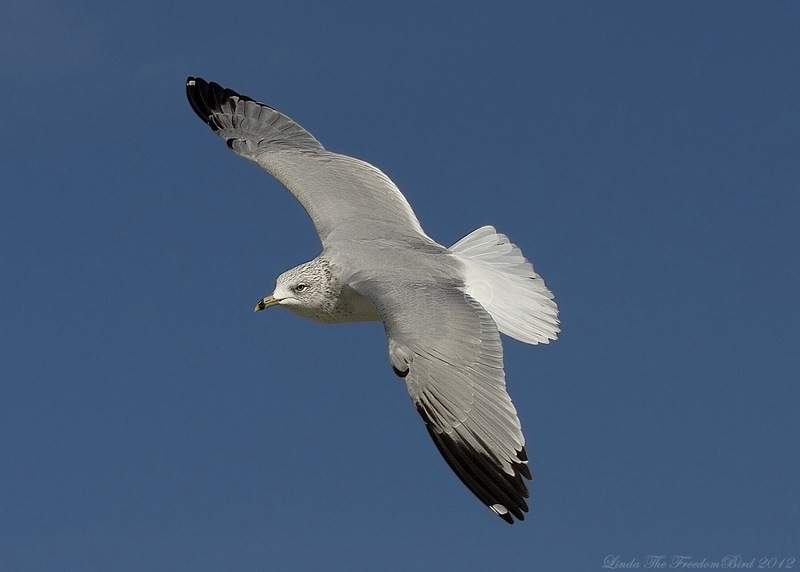 Ring-billed Gulls (Larus delawarensis) are very sociable and they are opportunists. They are comfortable around human and you often find them congregate on beach, golf course and large parking lot near lakes or seashore. From their name, you can immediately tell that there is a black band circled around their bill. Many other gulls have either black dot or red dot around the bill. So pay attention when you see a gull next time. It will take up to three years to grow into an adult gull. Their plumage changes dramatically during the first three years. Breeding adults have a white head and non-breeding ones have brown-streaked head pattern (as shown in this photo). I photographed this gull in flight near southeastern Georgia, a harbor city called Brunswick. While waiting in a fast food restaurant drive-thru lane ordering my lunch, few gulls were circling around parking lot and seemed to occupy the whole place. This gull suddenly flapped his long wings and flew towards cars without any warning! Omg! I don't know what this gull have in mind but one thing I do know is no one will throw their French fries or hamburgers in the air.